"Versatile" is how one might describe Kingsley and its unique style. It's a little bit turn-of-the-century ornamental... a little bit antique Shaker... while remaining truly timeless. It's a singular styled bathroom suite of products that spans all generations... and it's offered exclusively by Moen Available in store by Special Order Only. See associate for details. The Method Single-Handle PosiTemp Valve Trim Kit from MOEN makes it easy to polish off your shower install or renovation. With modern styling and a lustrous brushed nickel finish, this lever and escutcheon will instantly upgrade your bathroom aesthetic. It fits onto a compatible PosiTemp pressure-balancing valve, letting you dial in your desired water temperature by rotating the handle through a 270 arc. Part of the M-PACT common valve system, this set makes it simple to substitute the trim without tweaking the plumbing should your future style preference change. Backed by a lifetime limited residential warranty, it features metal construction and a LifeShine protectant to guard against flaking, tarnishing and corroding. This kit requires MOEN valve 2510, 2520, 2570, 2580 or 2590 (not included) to complete installation. The Roth bury line offers a relaxed blend of vintage design and traditional elements that coordinates perfectly with both casual and luxurious decorating styles. Moentrol pressure-balancing valves deliver perfect water coverage, force and flow and have temperature memory to prevent hot and cold surges. 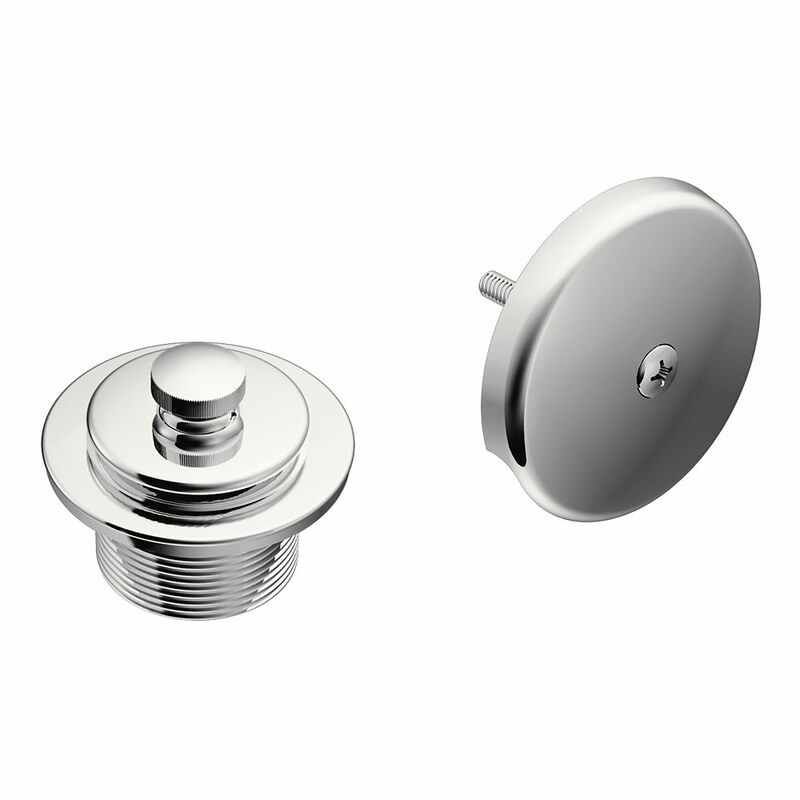 Chrome Push-N-Lock Tub Drain Kit With 1-1/2 inch Threads From finishes that are guaranteed to last a lifetime, to faucets that perfectly balance your water pressure, Moen sets the standard for exceptional beauty and reliable, innovative design. Chrome Push-N-Lock Tub Drain Kit With 1-1/2 inch Threads is rated 4.4 out of 5 by 19. Rated 5 out of 5 by Steve from Both parts fit perfectly. Both parts fit perfectly. Rated 5 out of 5 by Ruth from I'm very pleased with the Moen drain covers. They are... I'm very pleased with the Moen drain covers. They are easy to use, easy to clean and hold water in my sinks perfectly. Rated 4 out of 5 by Wilson from Very nice quality product and went well with my existing... Very nice quality product and went well with my existing Moen tub fixtures. The knob on the drain fixture is much thicker and of a higher quality than similar off brand tub drains which are a couple bucks cheaper. Highly recommend this product. Rated 5 out of 5 by HomeDepotCustomer from Just what I needed!!... Just what I needed! !